The market usually offers donuts and coffee for a small fee; and that’s a good thing, since shopping opens at 7am (some regulars tell me they start as early as 6am). Arrive in the first couple of hours if you want a chance at the best stuff. Arrive late if you want to haggle down to as low as 50%. 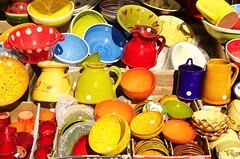 The Arlington Flea Market takes place every first Saturday of the month from April-November and is open 7 AM-1:30 PM. Free parking located across the street at Quincy Tech Park (entrance at 15th and N Quincy Street); additional street parking available. Cash preferred by most vendors.